A New Kind of Christian' s conversation between a pastor and his daughter's high school science teacher reveals that wisdom for life's most pressing spiritual questions can come from the most unlikely sources. This stirring fable captures a new spirit of Christianity--where personal, daily interaction with God is more important than institutional church structures, where faith is more about a way of life than a system of belief, where being authentically good is more important than being doctrinally right, and where one's direction is more important than one's present location. 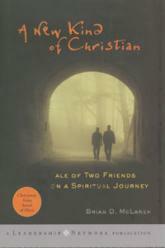 Brian McLaren's delightful account offers a wise and wondrous approach for revitalizing Christian spiritual life and Christian congregations.